The word “blog” comes from the portmanteau “web” and “log”; thus we have “blog.” A blog is a new mutation, an update to writing; it is also a webpage. Humanity has been writing for thousands of years–on different surfaces: rock (walls), papyri, and dried stomachs of mammals–; now we can write with 0’s and 1’s–binary code. Gutenberg’s press, and the invention of the mechanical movable type, allowed for education (and writing) to democratize. It broke down the walls of monasteries and cloisters. Almost six centuries after this important invention–in the late 20th century, 25 years ago–, the Internet made its first popular appearance. Not too many years passed before it was referred to as “Gutenberg 2.0.” The dawn of the 21st century has seen the inception–and its actual embryological stages–of a new way of consuming and producing information. Unfortunately, and reasonably so, blogs still need a lot of justification. The justification for this blog will be found on its weekly posts. This space cannot be considered as something finite–the internet promises to have no end: an ever flowing, always nourishing Nile of information. Blogs cannot escape this increasingly dynamic context. What is The Hypertextual Lounge about? The mission of The Hypertextual Lounge (THL) is to share multimedia relevant to what students from high school talk, learn, and, most importantly, ignore. The main objective is to build a virtual community through the sharing of texts, images, video, music, pedagogical resources, etc., that can be of use to anyone that dares call himself (or herself) a student (or a teacher). As a museum curator organizes an exhibit with a conceptual thread in mind, The Hypertextual Lounge will ‘curate’ the Internet–framed in the pedagogical context of responsible and significant media consumption. What have the students done in the club? What will they do? Even when bloggers like Ariana Huffington, Cory Doctorow, and Yoani Sánchez are widely popular around the world, many people don’t know what a blog–or the Internet–can do. That’s the best case scenario. Unfortunately, and this is a common occurrence all over the world, many believe that blogs are just cesspools of narcissistic detritus. It is true that many of them are nothing more than a digital iteration of what we’ve come to accept as “normal” in traditional media outlets (TV, Radio, Newspapers, etc. 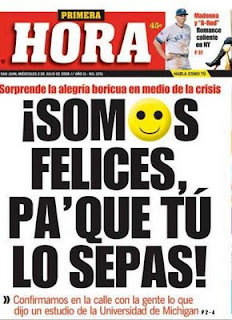 ), others are a bit more quixotic–they aspire to be something more (a few examples are: io9, Open Culture, Brain Pickings, Puerto Rico Indie, El Ñame, and many others). During these past few months, I’ve shared hypertexts (here, here, here, here, and here) with the club members; all of them shown with the following purpose: to modulate their erroneous perception of the Internet, and to help them thread their own philosophy about digital literacy. Critical thinking, interdisciplinary approaches, technical skills, etc., are all part of what club members will get out of this experience; tools that will be helpful for their academic and professional experiences as well. This virtual community–in which club members will play a very important role by promoting the blog, by giving technical assistance, by uploading new posts every week, and by browsing the web (reading skills)–will have The Hypertextual Lounge as its common space: a medium that allows the reader to interact with the author. Mushrooms through my iPhone camera. They are not animals; they do not move, nor do they photosynthesize. They are capable of doing one very important thing, a dirty job: they deal with death. 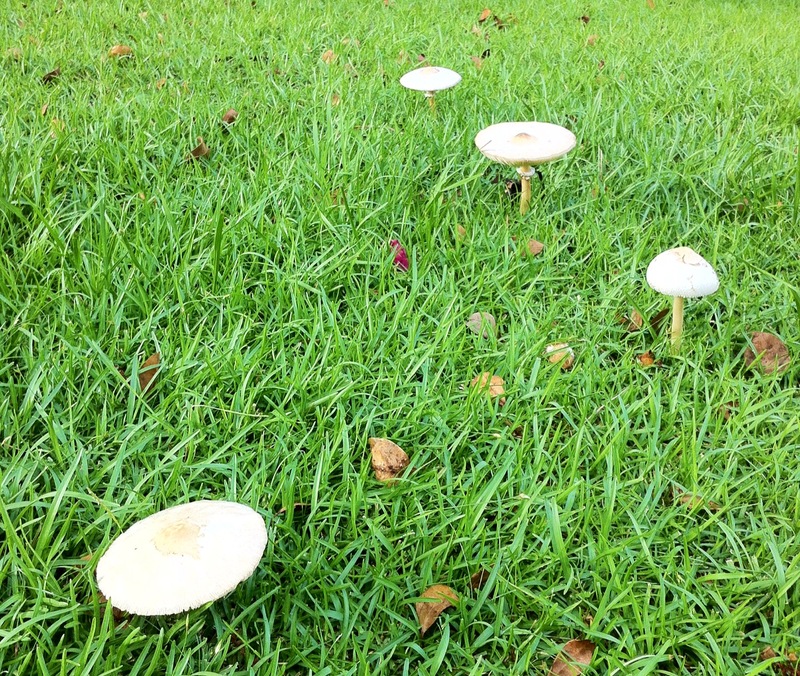 In this the very first post of The Hypertextual Lounge, I will tell the story of the mushrooms that have been dancing–with the moon, the earth, and other vectors (rain, detritus, cats, dogs, and insects)–in my front lawn, for the last few months. They explode into white patches of life, in an otherwise green and boring landscape. 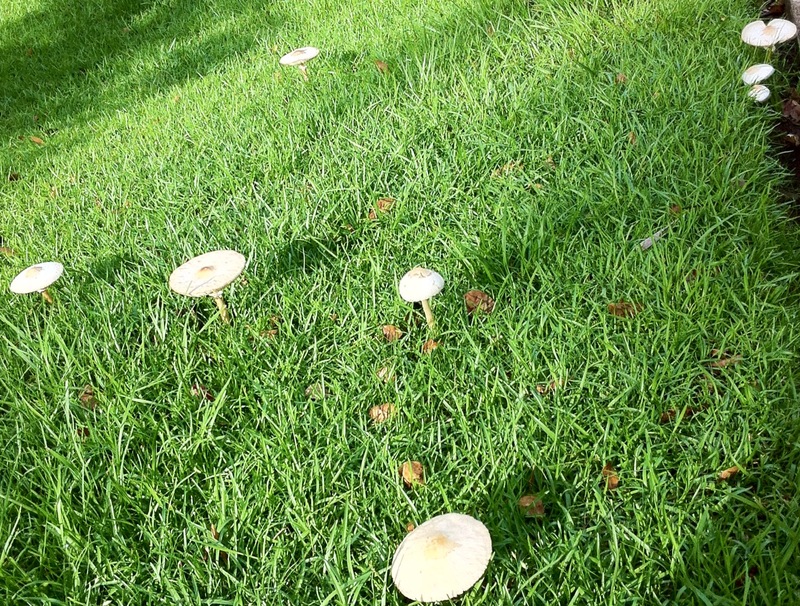 It appears as if these mushrooms grow overnight. One day there is only one of them in its early budding stages; the next day there are three or four new ones. 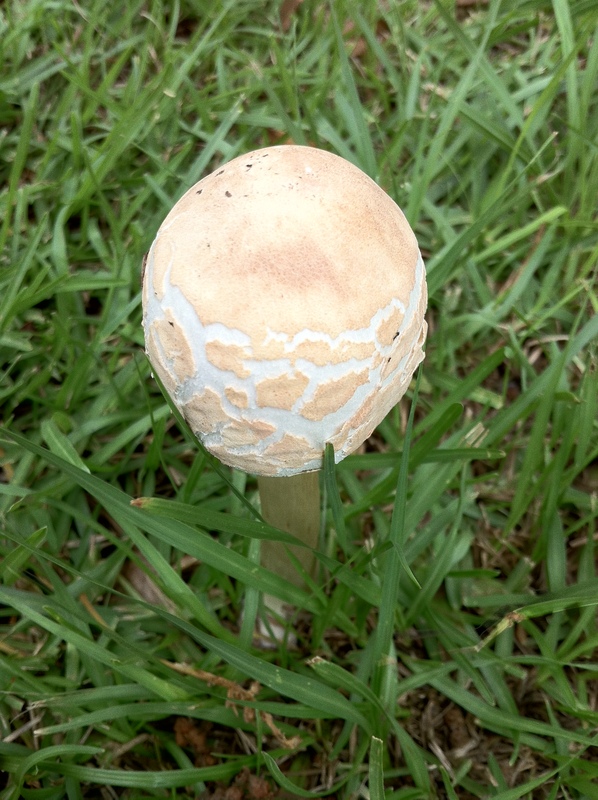 I now have a better understanding of the metaphor “to mushroom”. Mushrooms have a lot of cool adaptations. 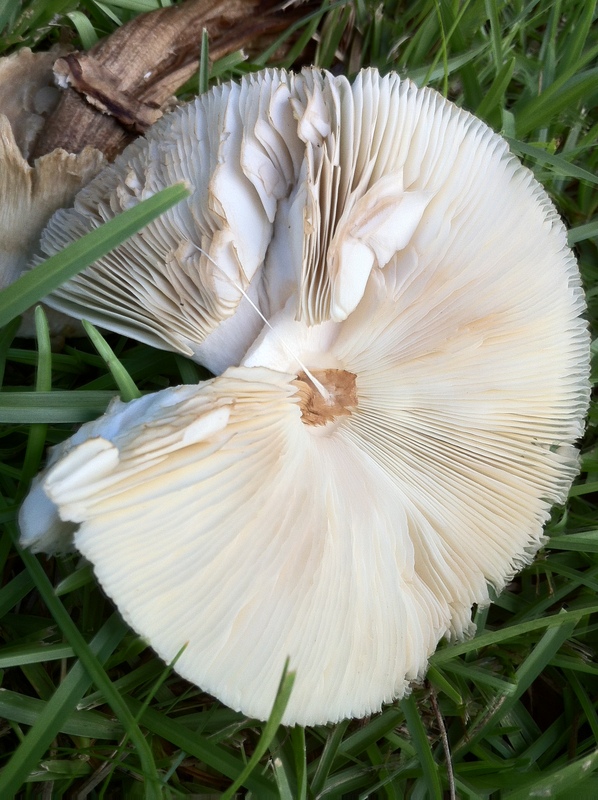 One of these are gills, which allow these organisms to spread their spores. Broken, torn from the Earth. El Hongo y el Gongolí. This entry was tagged fungi, iphoneography. Bookmark the permalink. 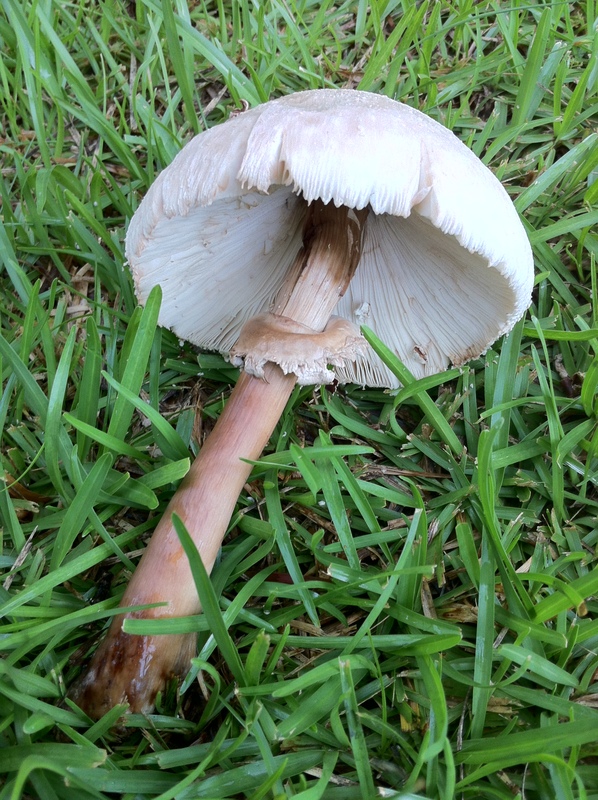 The part about the mushrooms is very captivating, I have a book about biodiversity in the urban areas of Puerto Rico called “Guia de Biodiversidad Urbana: Especies en Ciudades y Bosques de Puerto Rico” ,written by Rafael L. Joglar, in which it is written that this species of mushroom is called the “Hongo Sombrillla Verde” or in English the “Green Parasol”, it’s scientific name is “Chlorophyllum molybdites” and it is native to Puerto Rico. It is quite common throughout the whole island and since it is venomous, handling it or eating it should be evaded. 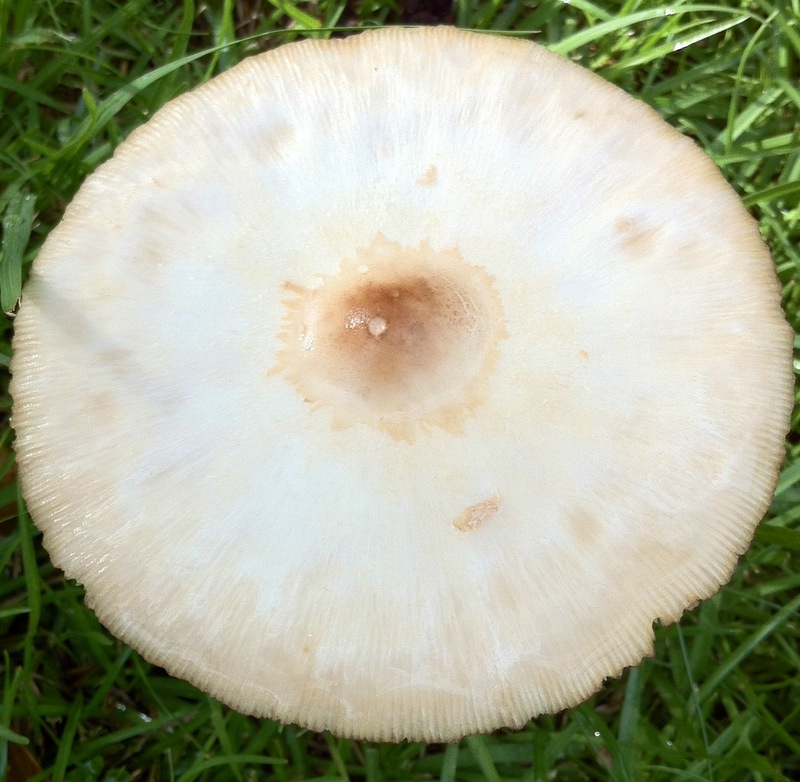 Fungi are very successful organisms. Tens of thousands of species on almost every area of the planet. Treasure that book: “Biodiversidad Urbana”; it is a puertorrican classic. The structure of mushrooms is very interesting and weird looking, i like to stare at them but i’m afraid to touch them since i don’t know which ones are the poisonous ones!! It is actually a good thing that you are afraid of them–many are poisonous. But these ones are poisonous only when eaten. 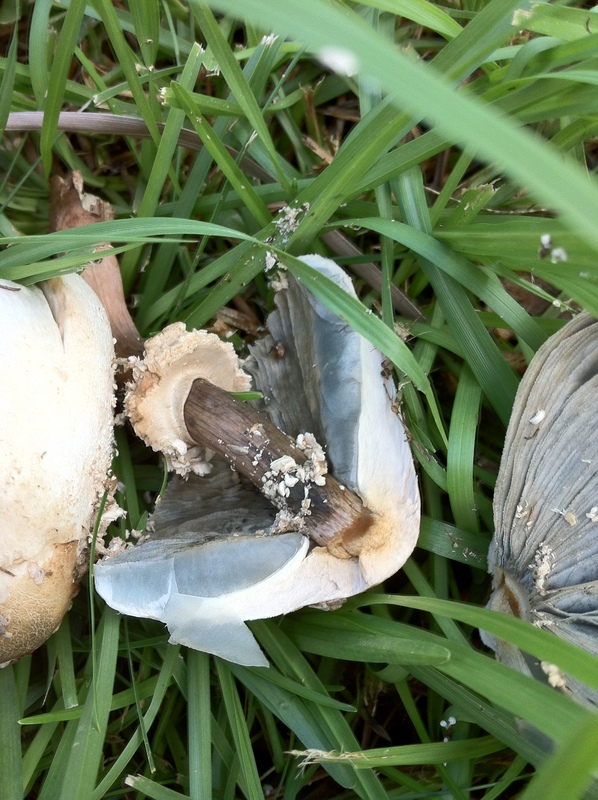 Not necessarily mushrooms come with excrement because in my house there is a lot of it because of a dog and we never see mushrooms, what could be the reason for it not growing? 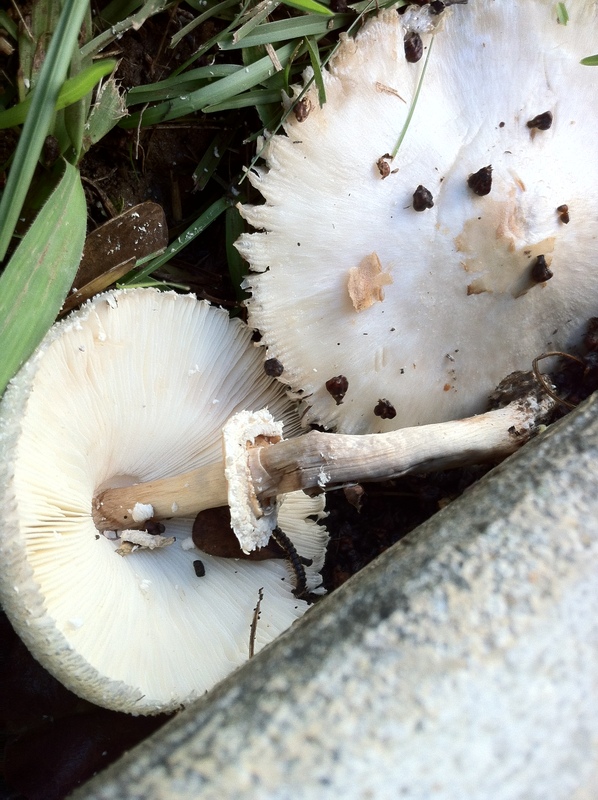 Mushrooms are heterotrophic organisms that feed on decomposing matter—be it excrement, rotting meat, vegetable matter, etc. 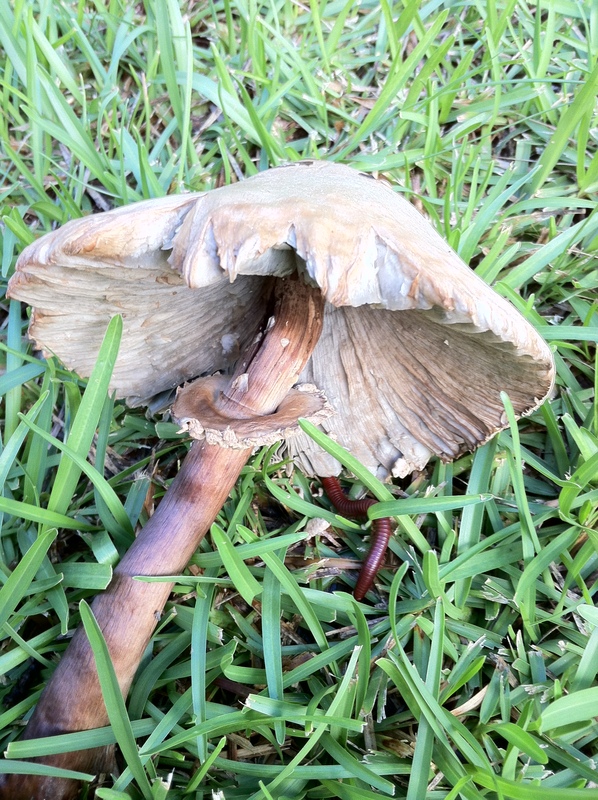 Mushrooms are opportunistic. Sometimes is better for them to feed on excrement—such as truffles, edible mushrooms that can be worth thousands of dollars in the restaurant industry—, sometimes they feed on dead; decomposing plant life. There are literally thousands of species. The ones displayed here feed on excrement. Thanks for the contribution, Andrea. 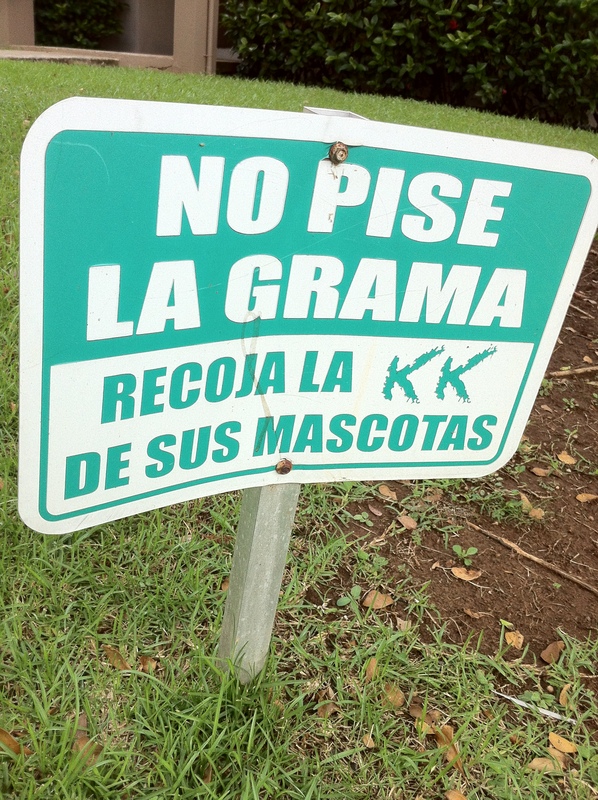 Voy a empezar la clase ahora. Thanks for the contribution, Wanda. Great find. I find mushrooms very curious as well. Mushrooms are really intresting because you can do many things them, but you have to be really careful because there are a lot of them that are poisonous. I love mushrooms. They are fascinating organism. So much history and art can be learned from studying mushrooms. They are beautiful.